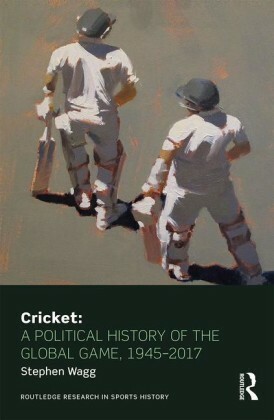 Stephen Wagg has set himself the ambitious task of writing a definitive political history of contemporary cricket. His study of politics considers, amongst many things, the impact of the Dutch Reformed Church on initiating apartheid in South Africa and how in 2016 CARICOM (the twenty-strong free trade association of Caribbean nations) called for a dissolution of the West Indies Cricket Board. He looks at the pitiful percentage of state spending on welfare in Pakistan and the social characteristics of Sri Lanka’s United National Party. He also notes the shifting of state initiatives in the west from ‘Sport for All’ to the funding of elite athletes. It is this examination of detail that make Wagg’s book such an important read. Divided into a number of distinct studies, the first section scrutinises each of the ten Test-playing sides (Ireland and Afghanistan had not been accepted at the time of writing). There follows a collection of themed chapters, some of which previously appeared as academic articles. Social class provides the thread that binds the pieces. This is expressed most obviously through the distinction of amateur and professional cricketer. Wagg’s opening chapter looks at how this played out in England, yet he also cites how Australian and New Zealand cricketers were expected to play for free. Despite this, the professional Glen Turner was paid less than the any member of the Kiwi touring side in 1976 who were all amateurs on expenses. Class is examined through key personnel such as Donald Bradman and Douglas Jardine. Jardine was the stereotyped English toff while Bradman defined his social class by aspiration. Like Bradman, England’s first professional Len Hutton was socially ambitious, sending his son to private school and attempting to modify his Yorkshire accent. Establishment-journalist EW Swanton’s social capital was manifest being a regular guest in the mansions of governor-generals when covering MCC tours. Rank and privilege similarly played a key role in the sub-continent. The Pakistan side of the 1950s, for example, was essentially the Punjab University team and the Ceylon Cricket Association was dominated by members of the island’s anglicised elite. The captaincy of these sides was an act of political symbolism. Wagg claims the emergence of one-day cricket as the catalyst in undermining cricket’s class system. The limited-overs tournaments in the 1960s represented a challenge to the prevailing economic order. Cricket was viewed as high culture and belonged to those who appreciated such things. This meant those drawn from the landed classes, the City of London and top professions. This group had fashioned the cult of the ‘gentleman’. Such a small demographic would not appeal to sponsors though, and by 1996, the head of the England and Wales Cricket Board had a background in retail and mobile phones. One feels his annoyance at Rachael Heyhoe-Flint who trivialised feminism, appealed for donations from businesses who benefitted from the cheap exploitation of women, yet was sacked for a jovial remark about taking Lord’s to an Equal Opportunities Commission if they didn’t allow a women’s match there. This is an academic book, though an accessible one that doesn’t leave you stretching for the dictionary. One feels, though, that the author had some fun looking at the language used by other writers. Walter Hammond, for example, wrote of Jardine’s “imperturbability”, while Australians considered his calm aloofness as “giving them the colonial.” Eric Midwinter described how the Second World War produced “a pother of suggested alterations.” Wagg himself is rather fond the term ‘larrikin’, used when describing certain Australians, alongside the occasional West Indian. Cricket faces a number of obvious problems today. The regional or county form is poorly attended, even in India. Recruitment relies on private education and elite academies, and for England on South Africans. T20 seems a better fit in a postmodern era with multiple leisure options and low boredom thresholds. Poverty and political uncertainty affect the opportunities to progress for the likes of Zimbabwe, Bangladesh, Pakistan and the West Indies. Stephen Wagg’s book provides an insightful read for those who view cricket through a political lens. It is an essential read for anyone concerned about the state of the contemporary sport and now available in a more affordable paperback edition.